All online ticket sales are closed — Please join us at the event to purchase any additional tickets at the door! 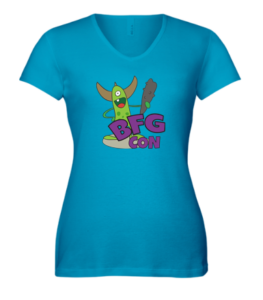 All advance sales are closed, see you at BFGcon! As we encourage families to game together, children aged 6-12 are highly discounted along with an adult registration. Children under 6 are free! 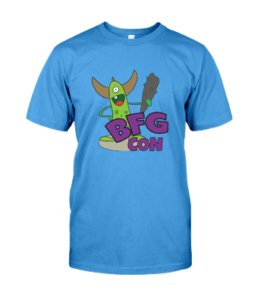 The deadline has past to order t-shirts before BFGcon. You will be able to purchase them onsite for delivery after the event. We are offering the shirts in a women’s cut v-neck, a standard fit unisex, and youth sizes. If you are interested in volunteering or running a game in exchange for discounted or free tickets, please check out our help us page which has full details on our opportunities.